The exhibition “Double Reflection” featuring portraits from the eponymous series by Caroline von Grone, will be on view from 20 May to 26 August 2017 at Galerie m Bochum. 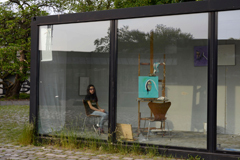 The Hamburg-based artist has been working on these two-part works since 2014, for a time in a temporary studio at Lehmbruck Museum in Duisburg, portraying in some cases people she encountered in the Kantpark just outside. 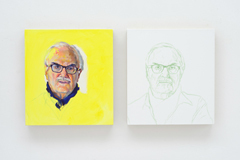 The portraits are now being shown for the first time in a large-scale show. The artist plans to make further paintings at Galerie m to continue this series, enabling visitors to experience her at work. When examining the finished works, the difference between the two processes of depiction, between presentation and representation, authenticity and cipher, is quite striking. The observed portrait, which bears Caroline von Grone’s own inimitable touch and intense coloring, seems more individualized and multi-layered. By contrast, the oil sketch done after the photograph offers only vague lines suggesting the basic contours, making a more stereotypical and distanced impression. The artist is working with people from all walks of life for her project “Double Reflection,” among them completely random encounters. She subjects all persons portrayed, whether known or unknown, to the same soberly observed, concept-oriented painting method. Von Grone’s body of work conveys an intense exploration of the medium of painting in the field of tension between a clearly defined formal structure, abstract gestural color, and arresting realism.